Peacock feathers are used to bring attention to this flower arrangement using color coordinating premium flowers including lime green cymbdium orchids green hydrangea and hanging amaranthus. 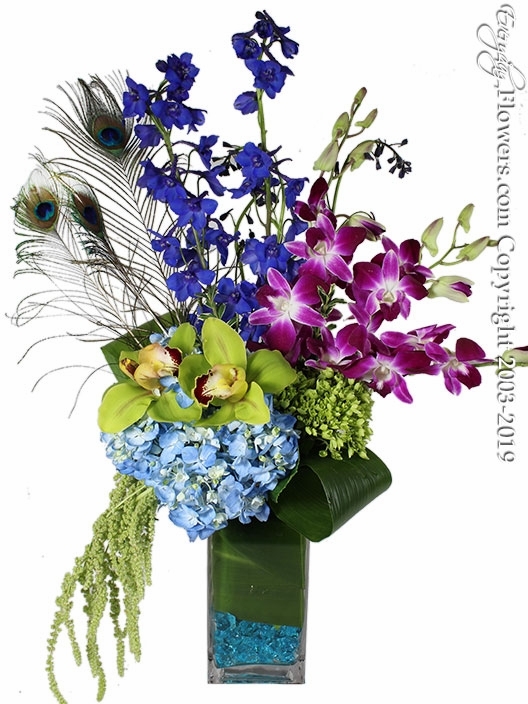 Blue hydrangea is placed to break up the lime greens and purple dendrobium orchid and blue delphinium is also used to bring height and add flare to the arrangement. Teal gems are placed inside of the glass vase with tea leaves that are placed to conceal the ends of the stems.